My setup time for pictures is usually pretty quick, because I find it more efficient to start snapping and correct on the go, than trying to get it perfect right off the bat. 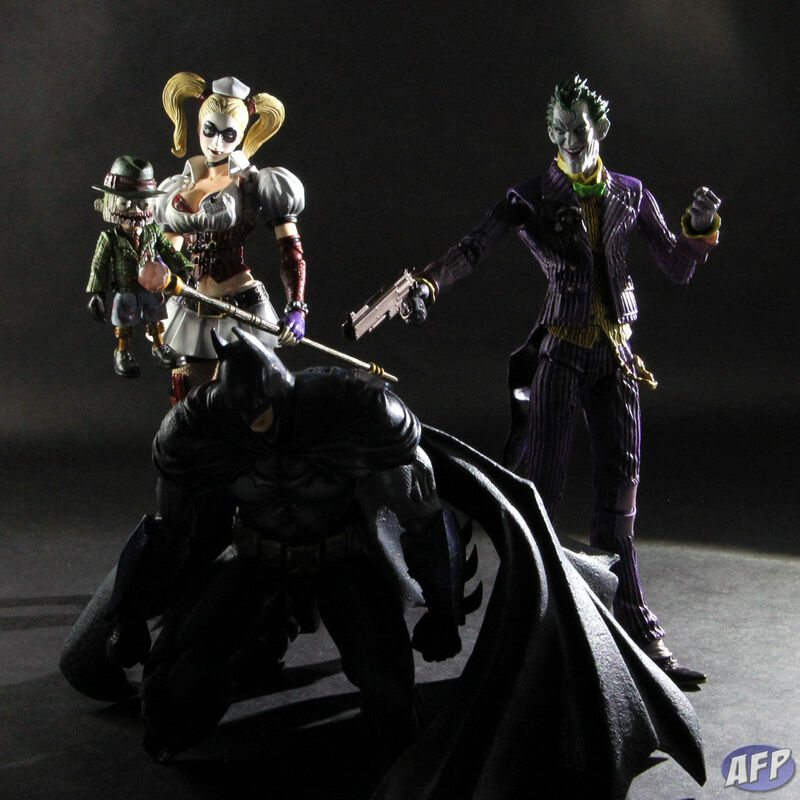 With this before and after shot of the Square Enix Play Arts Kai Arkham Asylum figures (they are really awesome, by the way), I’ll highlight some lighting issues you might come across and give you some quick and easy solutions for them. With the setup for the first shot, you’ll see I used my LED book lights to provide a backlit photo, for drama, of course. But because I was lazy and didn’t clear off the left side of my photo area, my setup area was smaller than normal, and so I’ve had to squeeze the lights into the actual shot. And with them both being too close to the figures and shining light directly on the camera lens, that’s where most of the lighting problems have been introduced. The first problem I’ll highlight is on Harley and Scarface (who is an interchangeable “hand” for Harley – cool, right?) 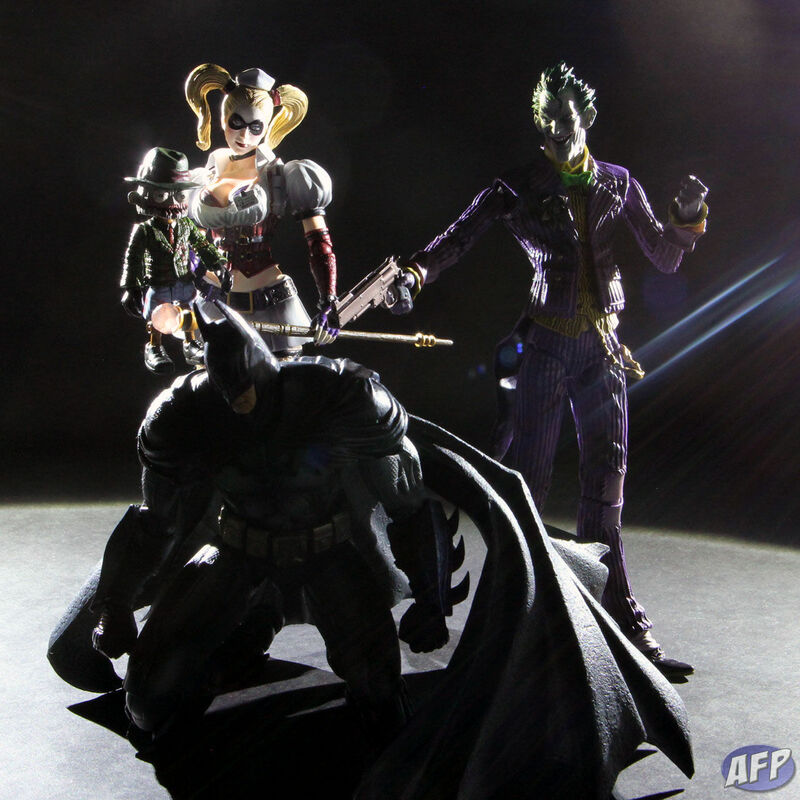 – with the light too close to them, you’ve probably noticed some haloing on Scarface’s hat and some harsh contrast on Harley’s chest. We can’t have that! The second problem is the lens flare and streams of light shining on Joker. That’s caused by the light on the right shining directly in the camera lens – because it is so bright relative to the light bouncing off the figures, it’s causing those visual artifacts like the haze and streaking. At some point I might explore the dramatic effect of lens flare, but having been flared out after watching J.J. Abrams’ Star Trek recently, I’ll save that for later. Here’s the setup for the second shot. To adjust for the lighting issues, I’ve made two quick adjustments. First, I’ve diffused the light coming from the LED on the left side just by sticking it inside the cheap paper towel diffuser that I’ve got on one of my remote flashes. The way it’s wrapped on the flash head, it forms a tube, and I’ve just put the LED light in the end of that paper towel tube. 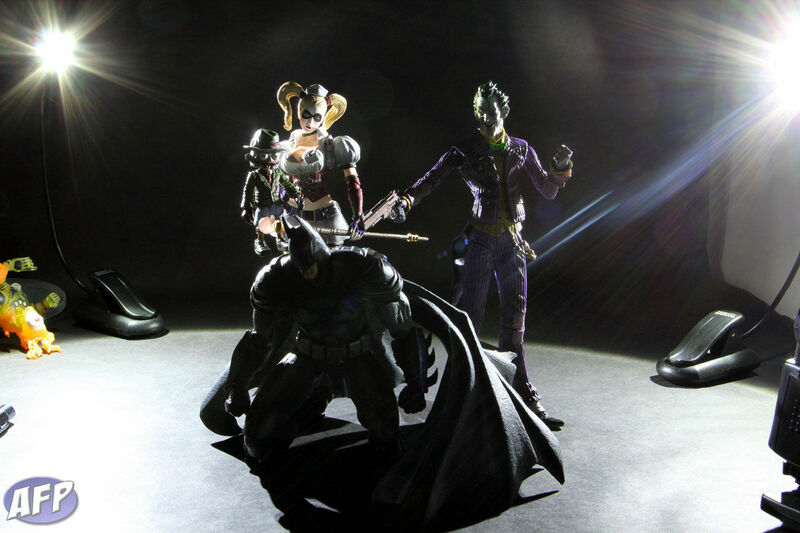 By diffusing the light, I’ve spread it around and eliminated that halo on Scarface and the harsh light on Harley. I’ve used the diffuser on my other flash to fix the lens flare from the right LED. I haven’t actually put the LED into the tube – it’s still shining directly on Joker. All I’ve done is put the diffuser between the light and the camera lens. By blocking the light that would shine directly into the lens, I’ve eliminated the flare. I’m still not that happy with the final shot, but as I ran out of time for this shoot it was what I went with. I used my DIY reflector to try to light up Batman a little more – but not enough, by the looks of it. 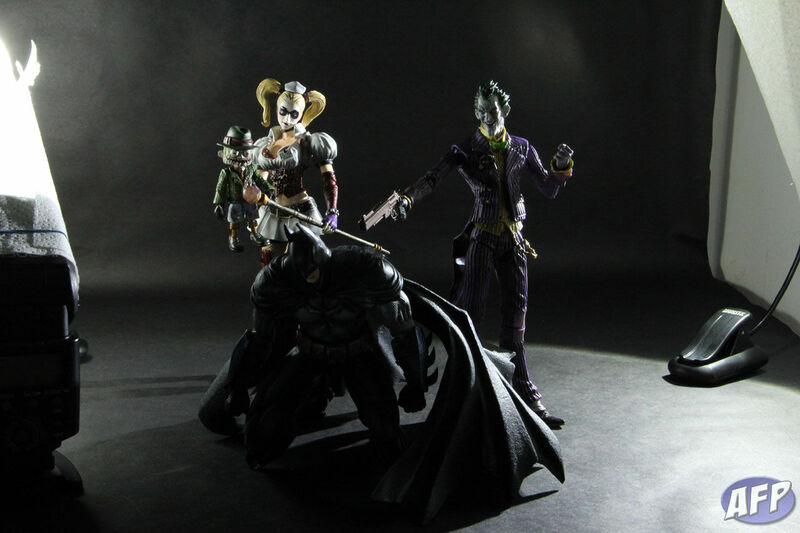 And I’ll see if I can work out some way to make those book lights even more focused spot lights – that’d be great for sculpts like Joker, with those sharp angles. Professional lights use tent doors to widen and narrow the focus of the light – I’ll have to experiment to see if there’s a cheap and easy way to do that on these small lights.